Ateneo De Manila University has suspended classes and work today (February 12, 2014) from 12 noon onwards due to a bomb threat. The Guidon, Ateneo’s official student newspaper, posted an announcement on its Twitter account confirming the bomb threat. 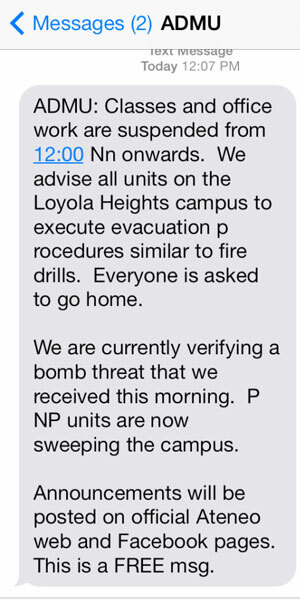 The administration has also sent a mass text message to all its students to evacuate the campus. Philippine National Police (PNP) units are currently on campus. Stay tuned for updates.